Meghe Group of Schools (MGS) is a network of 23 educational institutions across Vidharbha, Maharashtra, with a vision to provide quality education for developing multi – dimensional outlook in students and make them better global citizens. MGS nurtures the future of more than 21,000 students by creating congenial learning environment encompassing scholastic and co-scholastic activities to enable students sustain in the modern competitive world. CSpathshala was introduced as a pilot project for class I to VII in Math and Computer at School of Scholars (Meghe Group of Schools) in 2017-18. After the successful implementation the lessons from CSpathshala have been integrated with Math and Computer curriculum of MGS groups of schools for the academic session 2018-19. There is lack of an appropriate curriculum, books/publishers which provided such activities and CSpathshala provided the right curriculum for the schools. CSpathshala Team has trained our Master Trainers through training programs and provided handholding support to the Master Trainers for conducting the Teachers Training. A two day workshop was conducted by our local Master Trainers Mrs. Geeta Ghormade, Head Resource Centre Meghe Group of Schools , Mrs. Pratiksha Mujumdar , Mr. Sushil Ambekar and Atul Bondre. 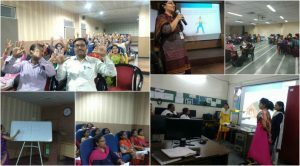 The sessions have been successfully conducted in June 2018 at Nagpur with the Meghe Group having trained 100+ Computer and Maths teachers from Standards 1 to 8. During the workshop the teachers revisited the importance of computing skills through presentations and videos. Selected lesson plans were explained to teachers who were also briefed on the implementation process for session 2018-2019. Groups of teachers were then given lessons and they demonstrated how these lessons will be taught in class and solved worksheets in the workshop. Going ahead the Master Trainers play an active role in mentoring and guiding the teachers in paving the way for successful implementation of Computational Thinking curriculum. The team has also integrated a feedback mechanism and experience sharing platform through the Whatsapp group and feedback form. In the last two months the teachers have been implementing the curriculum and sharing interesting stories of children enjoying the learning experience. CSpathshala has provided a Way of thinking – Logical thinking amongst students!